(Disclaimer: This piece is full of so many cheesy jokes even I'm not sure where they stop.) I know many of you think of 3D photography as a shallow gimmick. But I've looked into it and I believe it has hidden depths. I firmly believe that 3D TVs and computers are the way of the future (ie, as we progress along the 4th dimension) and then 3D photography (both still and video) will really take off. As evidenced by these photos by Aioe Kitsune, we can take great 3D photos now. All we need is an easy convenient way to view them, and I know that's coming. 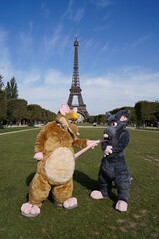 The photo above points you to a selection of 3D and 2D photos of Wiggy and Ziggy (our more Ratatouille-esque suits) in front of the Eiffel Tower, taken by aoi_the_kitsune. These may be the first 3D fursuit photos taken in front of the Eiffel Tower, but I'm sure this will become more common in the future. You can find info on how to view the 3D photos here, including links to viewing glasses and software. I find the easiest way is to use viewing glasses. I have a limited number of small viewing glasses, which I'm willing to mail out to friends if asked. All love to Aoi for organising this shared dream of colifox and myself. OMG, that's awesome. And cute. Awesomely cute! We wouldn't have gone out if it was raining, but it was summer over there and it gets quite hot and humid in Paris. I was sweating from every part of my body at the end of it. The suits were quite wet. So awesome. I actually like this kind of 3d photos because they seem to work better for me. By choosing the small size image (240 x 159) I found I could freeview the 3D images very easily. Just click on the image and that takes you to the "LightBox" viewer and you can click on "View all sizes" and choose the image size.